Everyone needs access to high-quality financial tools. They give entrepreneurs the keys to start businesses, let parents send their kids to school, help families finance the significant moments in their lives — from marriages to children to retirement. These tools are helpful for building better lives, but they are also necessary to help people stay resilient through life’s worst moments. Buildings collapsed in Mexico City after the Puebla earthquake. With the earthquakes, hurricanes, floods, and wildfires of 2017, it’s becoming increasingly clear that those with the least money often pay the highest price during natural disasters. Many of the world’s poorest people live in communities that lack resilient infrastructure and financial tools. Often, these are in hot regions and coastal areas that are vulnerable to harsh weather. For people to prepare, rebuild, and feel confident that their families will get back on their feet, they need access to financial services and tools such as insurance, savings, and loans. Globally, there are 3.8 billion low- and middle-income individuals without adequate coverage. The Center for Financial Inclusion at Accion and the Institute of International Finance are researching how to provide affordable “inclusive insurance” for these underserved consumers. The purpose of this research is to help insurance companies provide better coverage for those who need it most. Losing everything due to unforeseen events is already devastating, but for people with limited disposable income and no insurance, it is almost impossible to recover. Without insurance, people cannot manage the financial shocks caused by natural disasters. These events can permanently derail businesses and force families into life-altering decisions, such as taking kids out of school and putting them to work. Considering how many people in emerging markets have mobile phones — and how few have insurance — the market is ripe for mobile insurance solutions. Microinsurance, one of the topics of the research, makes coverage more accessible to low-income consumers through lower premiums. Insurance companies are updating their offerings due to the demand for these more modest insurance products. There has been a lot of growth in this industry in the last decade. From 2005 to 2016, prominent insurance companies that provide microinsurance grew from seven to 60. Insurance companies are also finding other ways to update their services and help make coverage more accessible for an emerging middle class around the globe. One example is creating uncomplicated plans, such as pay-as-you-go models. Another opportunity that is helping widen insurance coverage is coupling services with existing mobile financial products or creating new mobile solutions that bring insurance services straight to a consumer’s phone. Without money and credit, how can someone rebuild after disaster hits? That’s a big question for the 3 billion people worldwide who lack access to bank accounts, credit cards, loans, or online money-transfer. José Ramón Gómez builds his business with funding from Financiera FAMA in Nicaragua. 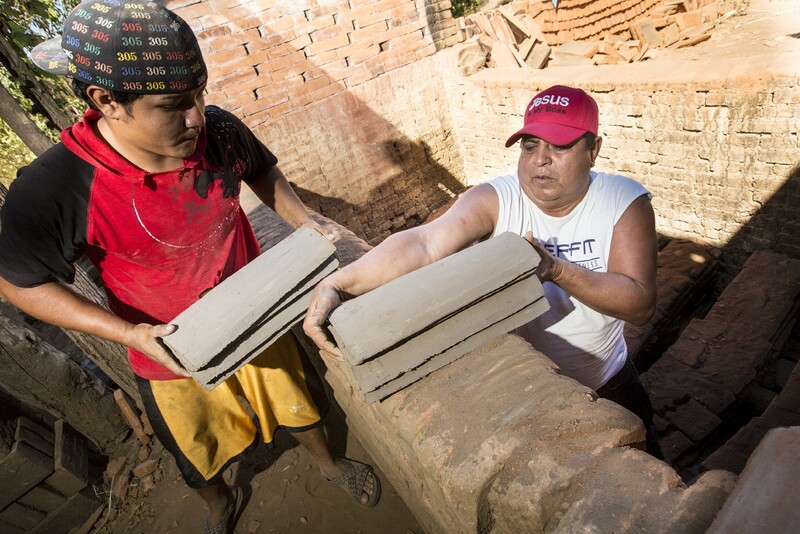 These loans reinforce his tile-making enterprise so he can help reinforce his neighbor’s roofs. To address this need, our partners go the extra mile to make financial services more inclusive. For example, one of our partners, Financiera FAMA, is building a digital banking platform in Nicaragua to bring small loans to rural clients, who have long been on their own without access to banks and funding. In Nigeria, Accion Microfinance Bank is developing a mobile savings-based loan program that will make it easier for lower-income customers to save and access small loans. And AYE Finance, in India, is helping small business owners who lack the financial history to secure a loan through traditional banks by evaluating them based on similar businesses and distributing funds. Thanks to innovative practices like these, people previously left out of the financial system can now take out a loan or start a savings account — simple actions that can prove invaluable in the face of natural disasters. Improved savings and loan services and inclusive insurance plans are necessary for people to take control of their lives when life feels most out-of-control. Let’s make sure everyone can build their businesses, support their families, and stay resilient in an unpredictable world.